Also, the maximum number of ads at the top has increased from 3 to 4. A: Google says, amongst other things, that the right hand side ads weren’t clicked on much anyway plus it wants to make the search results the same on desktop, tablet and mobile. Most searches now happen on the latter which obviously doesn’t have a right hand “ad rail” anyway. Q: Good News or Bad? A: This is where you have to laugh a bit. 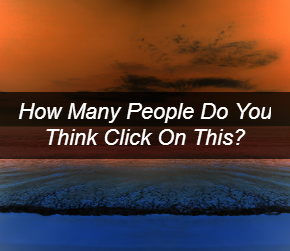 ‘A’ sells pay-per-click training and ‘B’ sells SEO training! Now, I don’t like being cynical because it’s a terrible trait that stops you taking the leaps of faith necessary to make any kind of money from any kind of business. But this is a classic example of why it’s important to always look at what people are TELLING you compared to what they are SELLING you. Equally, it’s wise to only take advice from people making money from the same methods they are training you on. For example, loads marketers sell training on pure affiliate marketing but they themselves make money from creating products and selling them using joint venture partners. Completely different, so no wonder the customers rarely, if ever, get results. What about the Google changes? I suspect it’ll make very little difference although really, I have no idea at all. And I suspect most others, even Adwords experts don’t either. But what I will predict though is a lot of information products showing how to make money out of it. That’s already started and it’s been the same every single change Google has made (at least since I began online in 2010). Some of it might be good, some bad. I’m not trying to call people out here or say everything is a scam. Rather, it’s simply worth taking your time, looking at how people are making money (rather than just what they are telling you) and comparing what they are telling you verses what they are selling you. Understood the other stuff, but can you elaborate on “Loads of marketers sell training on pure affiliate marketing but they themselves make money from creating products and selling them using joint venture partners. The methods that a lot of marketers use (like creating products and doing JVs) often seem hard to beginners and therefore are more difficult to sell training courses on. 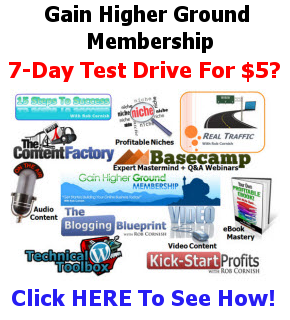 So instead some marketers opt to sell training on methods that appear a lot easier (such as pure affiliate marketing). Hope that clarifies a bit for you M.
Good post and a timely reminder – not to get sucked into the marketers selling ‘Google Tactics For The Latest Scary Changes’ type ebooks or even cobbled together software. Not a very well hidden agenda. It’s all about the bottom line. I rarely click on the ads. I don’t think it will make much difference, like you I don’t know. I will be avoiding any products that come out. Like anything Google does, we will adjust the way we work by watching the experts we follow. Enjoy your emails and Blog. Once again – good, clear, practical, words from Rob. Appreciate it. Have a great weekend. :). Great stuff Geoff, thanks for commenting. I think what you are seeing there on the right hand side is “Shop for hotpoint ovens on Google”? 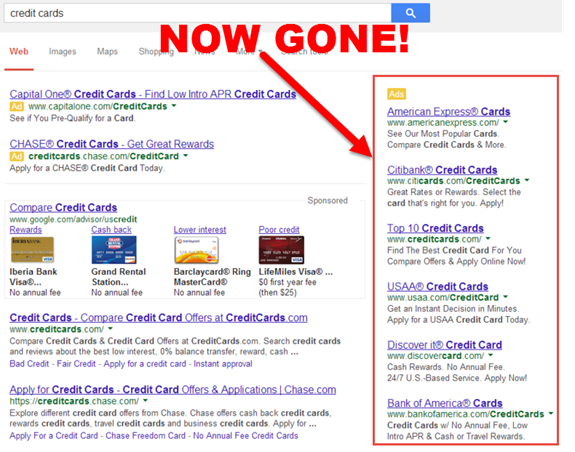 Those are indeed ads but put there by Google themselves and not through their Adwords platform. I probably should have clarified that in the post so thanks for pointing it out so that can be done here. Yep. It just keeps proving the point. Build your business on many pillars not just one or two that are prone to change every couple of years. Excellent point Mark – I learned that lesson the hard way back in 2010 when I relied purely on SEO. Interesting – I’ve just written a piece incorporating this for a client and you’re right Rob, there are various explanations and analysis as to why Google have done this. Who you believe I guess depends on how cynical you choose to be! 1. A simple march towards Google favouring higher spending advertisers as opposed to the ‘little guy’ and steering more people to advertise as opposed to relying on ‘quality content’ etc to rank? Some – and this includes certain personnel involved in digital marketing for their organisation – offer the view it’s part of an overall ‘streamlining’ of the search experience and a convergence of mobile/desktop searches. My concern is how Google will reconcile valuable results to the searcher as opposed to paid ones. In other words, will crummy yet paid for results dominate as opposed to unpaid ones bristling with good content and relevancy that ends up ‘below the fold’ with more paid ads above? If so it goes against the grain of Google’s avowed aim to reward content as major updates have tried to do as we know – and apparently continue to do so. Very interesting Mark, you raise some excellent points. Regardless of the eventual outcome, the change per se does seem pretty dramatic to me so it’ll be fascinating to see what comes of it over time. Like you Rob, I have no idea if good or bad – depends on the individual’s marketing methods, i suppose. Good advice about looking at the messenger – something I always do cos it puts perspective on the message. This is valid throughout life from health to shopping. In fact in the world of health it’s terribly valid and an area where most people are messenger blind to the men in white coats – another story. I like your upsell email – nowt wrong with the interflora upsell as all done on one page and very helpful. A few weeks ago I bought a product, more for interest than anything. By the time I’d got to about the 5th consecutive upsell I was ready to ask for a refund! Yes 5 is about my limit too Graham! Like your phrase “messenger blind” too, captures the problem well. I believe Big G made this move from a pure profit motive. We now have just 4 spots that all PPC advertisers must COMPETE for, bidding up click prices, putting more money in B ig G’s pockets. IMHO, I believe MANY smaller, and/or beginning PPC advertisers, will be forced to refocus their advertising efforts on SEO, which is great for SEO purveyors and rank-n-rent SEO lead-gen marketers, like me. I see the change as a good thing. Yes, it means PPC campaigns will change considerably but natural search marketing will, mostly, remain the same. There will of course be a slightly heavier bias towards local results targeting. I see the change from a development standpoint. Google appears to be in the process of merging desktop and mobile results, this being a natural evolution along the way. The cleaner page looks far less cluttered, which has been a main aim of Google since… forever. It’s refreshing to read someone in the IM world admitting that they don’t know, so thanks very much for that! And it was definitely a lightbulb moment for me when I started looking at the advice an expert gives against what they are selling. It’s important to avoid being cynical, of course, but looking at the bigger picture beyond the advice itself can be really helpful.